Two days ago we had to say goodbye to a beloved pet. 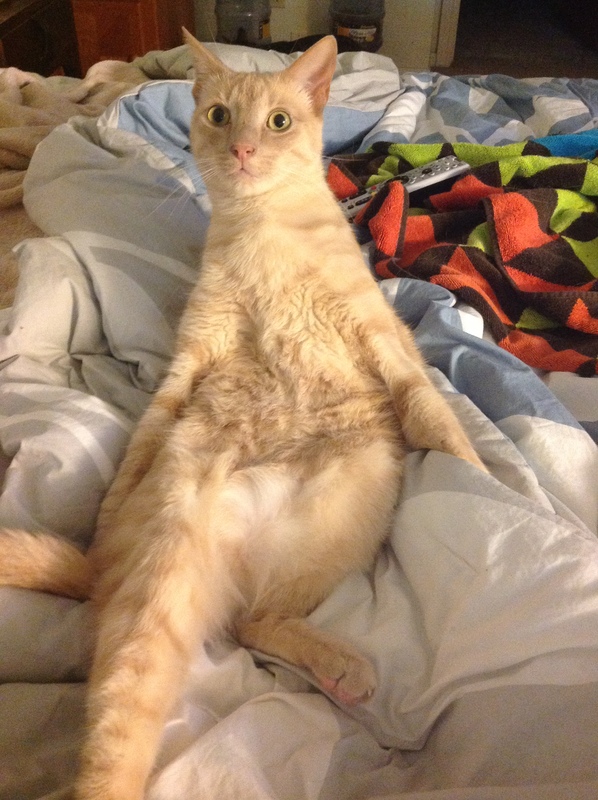 A 10-year old orange tabby named Julius Theodore, pictured here. Look at this nut! It is never easy to say goodbye to a beloved pet, but I’ve always believed they will tell us when it’s time. Maybe it’s just when we are lucky enough to have the opportunity to accept what is happening and handle it like mature, responsible adults. We’ve owned many pets over the years and when they get so old that their organs fail, and it’s their time to go, I’m with them the entire time. it’s the last best thing I can do for my furry friends. But Juju was only ten years old and Christie especially is heartbroken. I started feeling a little guilty. If we had had pet insurance, would it have covered the unbelievably expensive MRI diagnostics and highly invasive surgery? Were we not being responsible pet owners because we didn’t have pet insurance? The premiums are expensive. The prices go up as the pet ages. To cover a ten year old healthy cat, it costs as much per year as we pay for $750,000 of term life insurance for the both of us. It’s a little less expensive when a pet is younger – however the odds of them needing insurance when they are young are almost non-existent. Not all advanced treatments are covered. On the two policies I looked at I would have had to pay for an “advanced” policy to cover MRI diagnostics. It’s not 100% coverage, and there is a maximum annual payout. Just an MRI diagnostic would have cost over $1000 out of pocket, with the expensive insurance. And that’s the cheap part of the treatment, surgery is much more expensive and then all the after care. And, once the policy had paid $5000 in one calendar year, they would pay no more. The reality of pet insurance, like all insurance, is that the insurance company’s primary goal and motivation is profit. Yes, they will cover all your normal vet visits (after you’ve met your deductible) but you should be covering those anyway with your emergency fund or possibly a separate pet emergency fund. When you factor in the rising cost of premiums, the annual deductible, what isn’t covered, the co-pay, and the maximum annual payout – it’s not a good value. We are better off by saving the premium into a large emergency fund to cover most common issues that could come up with our pets. We had ten great years with Julius. He was our little Mister Man. He was a rescue, and there are other pets that we will rescue in the future. Our pets get the best care available. But we’re not spending that kind of money on a cat. It’s a cat. That’s the decision we’ve made for our furry family. You’ll need to make the same decision for you and yours. Do you disagree with my analysis? Do you operate under a “No matter what it costs” perspective with your pets? Tell us in the comments below.